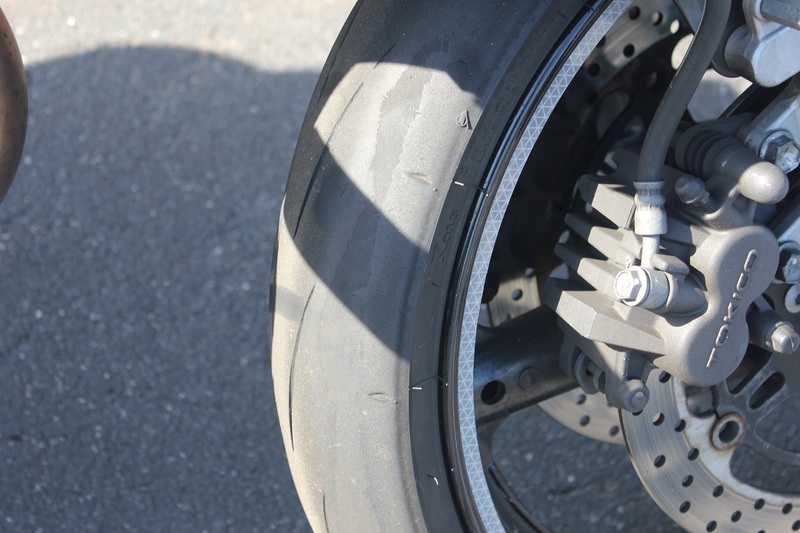 Sportbikes.net > Topic Discussions > Suspension and Tire Tech > Should a Q2 wear this fast? Should a Q2 wear this fast? Background: Newer rider with about 5k miles ridden. This particular tire has only about 4-4.5k miles on it. No track-days of any kind; I'm still learning how to ride. First off, what the hell is with those patches? They're all over the sides. Secondly, most of the tread is gone everywhere but the center. It's passed all the wear patches. Is this even remotely normal mileage? 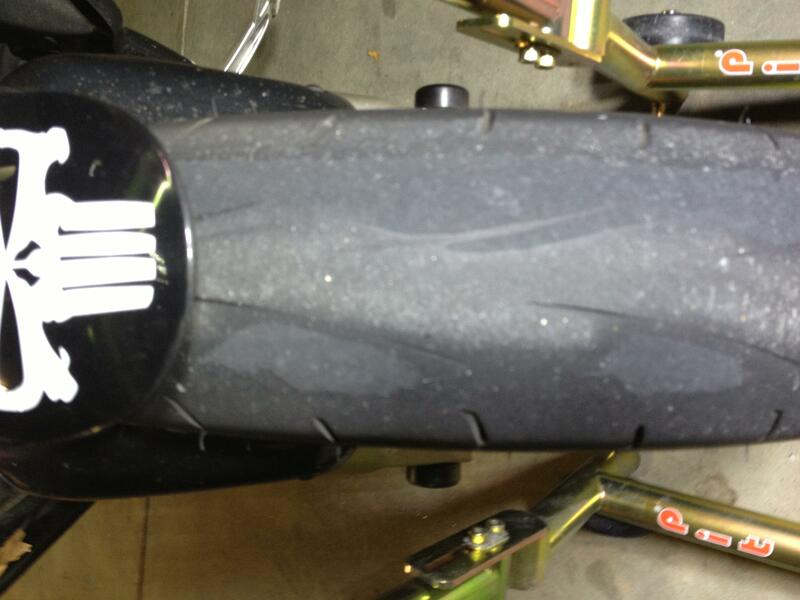 I've tried to research this tire and people on liter bikes are getting 8, 10, even 12k miles on a front Q2. I don't understand how a sv650 did this much damage. Last edited by CoonDawg; 05-07-2014 at 04:48 PM. Yes, I've gotten those kind of wear patterns, especially back when I'd carry more speed into the corners. I'm working on that and getting better wear patterns. But the question is: can I still ride? Are you checking your tire pressure on a regular basis? Then don't be surprised if your tires wear prematurely. I'm kidding, I'm kidding. It never varies more than a few PSI from 36. From my experience, that wear is usually caused by running too low of a pressure. It could also be the way you ride or maybe suspension related. What is your compression and rebound damping set at? I really don't know about the suspension set-up; the only thing I did with the suspension was set the sag (and I've lost 30 pounds since then). I wasn't even aware that the SV650 was capable of any rebound settings. I'm almost certain my problem is braking up to the apex. I actually do it a lot, and will start working on that. I ordered a front (PR4) that will be here Monday and just put on brand new EBC HH front pads (which--against all your advice--I'm going to go try out). So we warned you the tire is not safe, why on earth would you "need" to go try your new brake pads? It isn't like with that tire you can actually test them out. Make sure you bed them in, but don't crash doing it. Because I had been having brake trouble and I wanted to see if new pads fixed the problem--which it did. Besides, I wasn't going around corners with it; the tread in the center is still OK.
Can someone explain to me why there is a different "layer" of rubber showing through on the bald spots, though? I'm confused, because I thought it went straight to the cords. It's actually stickier than the surface tread. Replace the tire just to be safe. I guess the reason for such wear is over inflated tires and road temp.